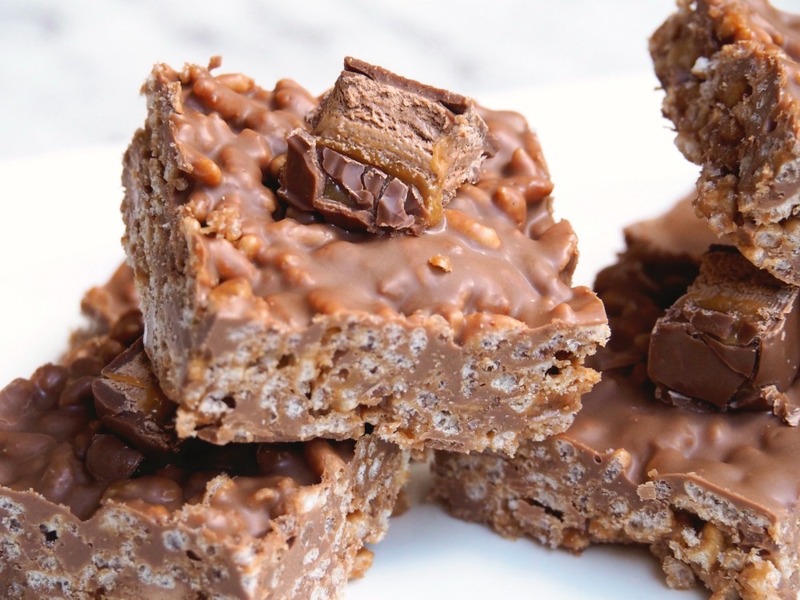 Mars Bars, rice bubbles and chocolate – this really is the slice trifecta! I’ve been obsessed with Mars bars since I was a kid. When it was exam season at high school, I used to eat a Mars bar for breakfast (true story) and to this day, I credit all my academic excellence to this humble chocolate bar. I love eating Mars bars (who doesn’t?) but I love baking with them too! 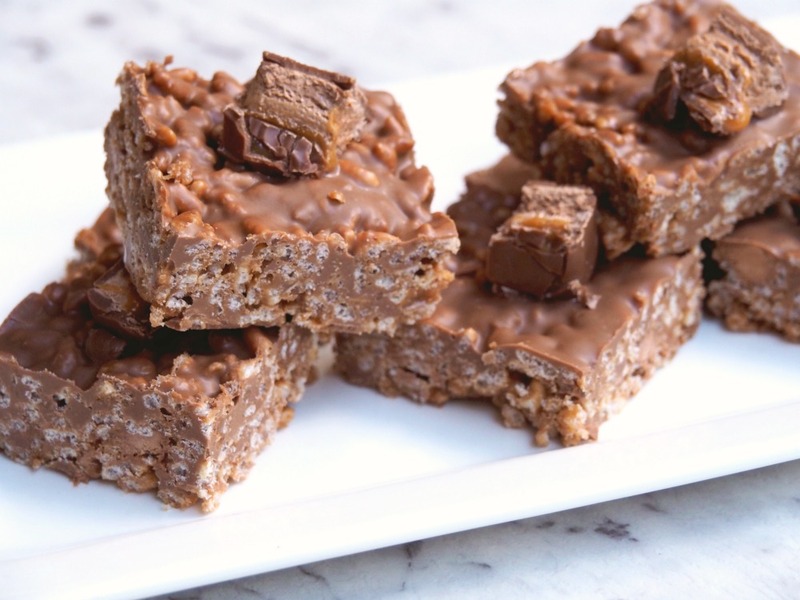 Have you baked my Mars Bar Brownies and/or these chewy delicious Mars Bar Cookies yet? If not, you need to! 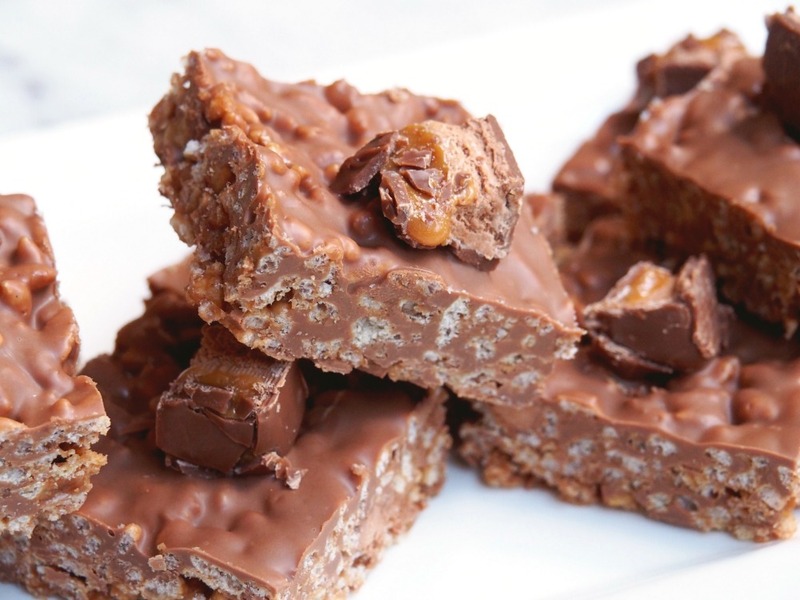 I first heard of and first tasted Mars Bar Slice when I came to Australia and I have my hairdresser, Heather to thank for that. Actually, I have a lot of things to thank Heather for, not least because she has been keeping my hair in check for the last decade. Now I know you shouldn’t worry about things that haven’t happened yet but sometimes I do lie awake in bed and worry about I’ll do if/when Heather retires! My hair will never be the same again! Trust me when I say Heather makes slices as brilliantly as she cuts hair because this slice is a keeper. 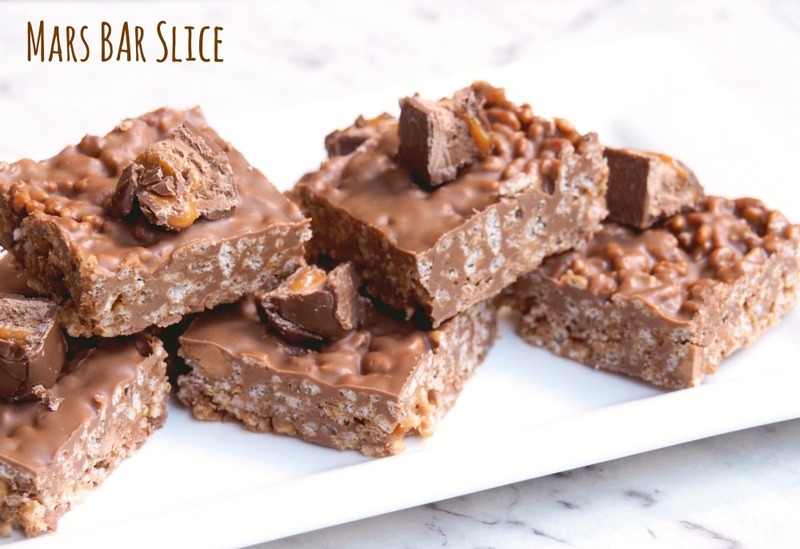 I have tweaked the original recipe slightly, cutting down on the rice bubbles for a greater bubble/chocolate ratio and adding a little bit of coconut oil to the chocolate topping, making the cutting of the slice a much smoother experience all round! I’ve also added a Thermomix conversion, although to be honest, this slice is so easy, all you really need is a Microwave, bowl and a spoon! The added bonus of using the Thermomix of course, is that you can “clean” your bowl with a glass of milk and be rewarded with a delicious cup of hot chocolate for all your mars-vellous efforts! What is your favourite chocolate bar? Are you in a committed relationship with your hairdresser too? Grease an 18cm x 22cm pan and line with baking paper and set aside. Melt 4 of the Mars bars, butter and golden syrup in the microwave on 50% power and stir until blended. 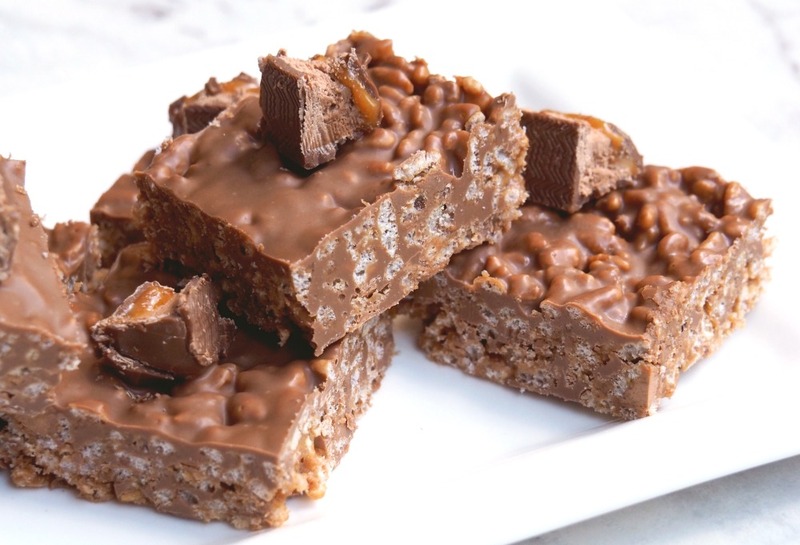 Mix in rice bubbles, 1 of the remaining Mars bars and nuts or raisins, if using. Gently press the mixture into the tin with a spoon and smooth the top. Break the chocolate into pieces and place in a heatproof bowl with the coconut oil. Melt the oil and chocolate in the microwave in 30 second bursts until just melted. Stir the chocolate with a metal spoon after each 30 second interval. Pour the melted chocolate evenly over the slice. 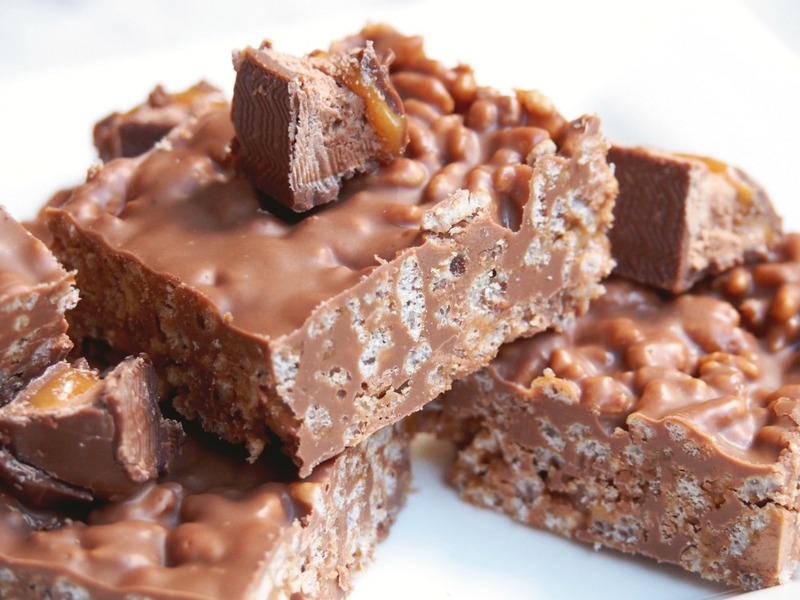 Decorate with the remaining Mars bar chunks and put into the fridge to set. Place 4 of the Mars bars, the butter and golden syrup in TM bowl and melt on 60 degrees on speed 2 for 3 minutes. Add rice bubbles, 1 of the remaining Mars bars and nuts or raisins, if using and mix for 15 seconds on reverse speed 2 or until well combined. Gently press the mixture into the tin with a spoon and smooth the top. Break the chocolate into pieces and place in TM bowl with the coconut oil. Chop for 5 seconds on speed 9 and then let for 2-3 minutes at 50 degrees on speed 3. To clean the bowl, pour a glass of milk into the TM bowl and mix for 5 seconds on speed 8. Heat the milk for 3 minutes on 80 degrees at speed 4, and you will have a clean bowl and a delicious glass of chocolate milk!